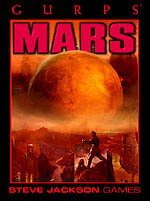 Cambias, James L. Designer's Notes, GURPS Mars in Pyramid Online. Canyon adventure, including elements for all 4 unstable shifts. Cambias, James L. GURPS Mars, Steve Jackson Games. General backgrounds (all 4 Mars used); maps. From the Earth to the Moon. Produced by Tom Hanks.